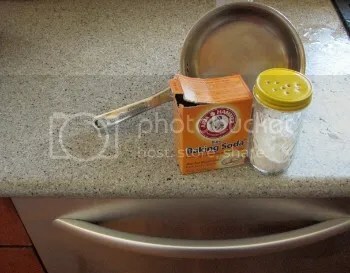 I may be the last one to the baking soda party, but I’m solidly there now. After buying a new box the other day, I happened to notice all the uses listed on the package. Just for fun, I tried it on the microwave, on some tea-stained pans and even on my beautiful brushed steel dishwasher. The stuff worked beautifully–easy, pretty shine and nothing that will harm our health or the planet’s health. And lest I forget–cheap, cheap, cheap (e.g., around $2.00 for a big, 2 lb. box). Notice how I made a convenient shaker by punching holes in a lid. So don’t worry if things get messy in the kitchen from cooking. That’s just part of making good, health-giving meals. Cleaning up is easy enough. Use Tip: Shake soda onto a barely damp sponge and just moisten surface to be washed. Too much water dissolves the soda and it loses its light abrasive abilities. And Don’t Forget the Bathroom: Great way to clean glass shower doors as well as sinks and other surfaces.